So here it is, the first dress. 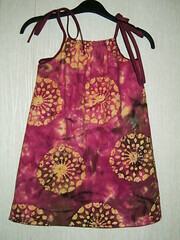 Unfortunately the photo does not reflect the stunning colours of the fabric. It is so small and adorable and I am having to resist making a little matching bag to go with it. This is the first of a few that I will soon be completing and sending off to Louise at Sew Scrumptious.